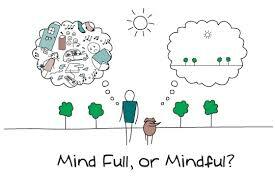 Mindfulness is learning how to reduce mental distractions, as the dog has happily achieved. It entails two main facets: “present moment awareness,” and “nonjudgmental acceptance of emotions and thoughts,” which is a process of allowing emotions and thoughts to arise without acting on them. (Teper, Segal, & Inzlicht, 2013, p. 1) Meditation is a primary tool in Mindfulness practice. A single object — often the breath — is taken as a place on which to focus to mind. It is natural for attention to wander, just as the reader of this essay may be distracted at times by sounds or sight. The key is to notice when distraction occurs and to bring awareness back to the chosen object, like this sentence. (Flock, p. 71) As with any skill, mindfulness takes practice, and it is not limited to meditation; rather, mindfulness is a style of attention. Modern Mindfulness (2015) defines it as “focused, relaxed attention.” You can do any activity with mindfulness. I interviewed Denise Casey, the Program Director for Modern Mindfulness, who has extensive teaching experience in schools and community settings and has practiced and taught mindfulness for seven years. (Modern Mindfulness, 2015) Casey has witnessed firsthand the positive changes for students. Given the mounting evidence that mindfulness is a powerful tool for students, I asked Casey about the challenges to bringing mindfulness into our schools. Casey hasn’t seen any concerns over the issue of separation of church and state, namely because mindfulness is a style of attention that can be taught outside of the context of religion. In Winooski the community is embracing mindfulness, which has been brought to town meetings and the police department. (Modern Mindfulness, 2015) When I asked Casey what impact mindfulness education could have on changing the long-term culture of Vermont schools, she replied that it could be “incredible.” I am convinced that she is right. Brown, K., Ryan, R., Creswell, J. (2007). 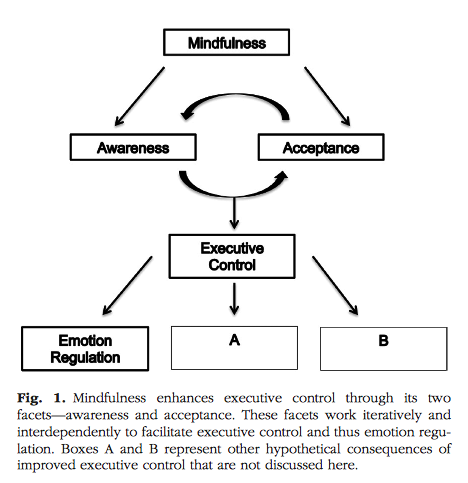 Mindfulness: theoretical foundations and evidence for its salutory effects. Psychological Inquiry, Vol. 18, No.4, 211-237. Rempel, K., (2012). Mindfulness for children and youth: A review of the literature with an argument for school-based implementation. Canadian Journal of Counseling and Psychology, Vol. 46. No.3, 201-2220. Mandy Snyder: I work as a personal chef and a teacher of dance, including Authentic Movement & Contact Improvisation. The meeting of creativity, mindfulness and inner transformation is my passion, and I enjoy the teachings of the Enneagram, Nondual wisdom and Sensory Awareness. I grew up in Vermont, then moved to the San Francisco Bay Area for 15 years. Last August I returned to my Vermont roots and I am so grateful to be back in this gorgeous and hardy state. View Mandy’s other article about Andrea Stander and Rural Vermont. This entry was tagged awareness in children, Denise Casey, emotional regulation in children, executive control, JFK Elementary in Winooksi, meditation, mindfulness, mindfulness in schools, Modern Mindfulness, professional development for teachers, Soryu Forall, teaching mindfulness to children, Winooski VT. Bookmark the permalink.